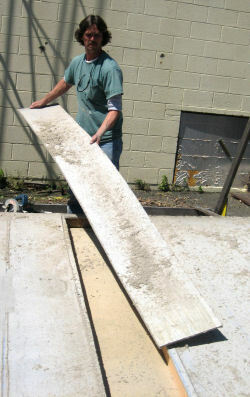 Homasote Company Sales Engineer, notes the solid seam in an assembly left outside for two-plus years. The Homasote Company Carpentry Shop prepares to take down the assembly after it was left outside for two years. It was built behind our plant on April 1, 2004 and left outside for two years, exposed to the elements, unpainted and unprotected. 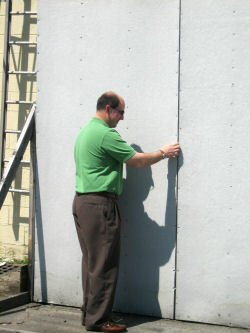 On April 26, 2006 this wall assembly of 440 SoundBarrier® was dismantled and cut into small pieces. Now our sales representatives carry them to demonstrate the amazing strength of "sote." After the panels were cut into strips and removed, the assembly skeleton revealed the extraordinary strength and protective power of our sustainable sound-control panels. Note (above right) how the end stud of the assembly is a dried-out, weathered gray. 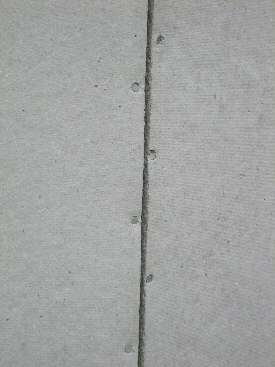 Yet the studs inside appear as fresh as they day the were first installed. When someone ask you if Homasote 440 SoundBarrier® can hold up in floor or wall assemblies, send him to this page. The now-famous "Blizzard of 2006" dumped as much as 27" of snow in the Northeast. 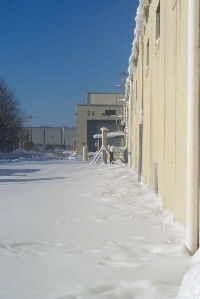 Our headquarters received approximately 14" but, as you can see, the unpainted 440 SoundBarrier® assembly erected outside on April 1, 2004 withstood the elements and stands strong. It dries out and remains strong. Homasote® has been used as a premium quality exterior vertical sheathing, with millions of square feet installed across the U.S. since 1909 for sound control inside structures, exterior vertical sheathing, and other structural building applications. 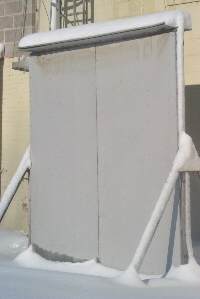 The unpainted 440 SoundBarrier® assembly has now spent an unbelievable 671 days out in the elements since April 1, 2004. Note how the seam between the 440 SoundBarrier® panels remains straight and strong, a testament to the strength of Homasote®. 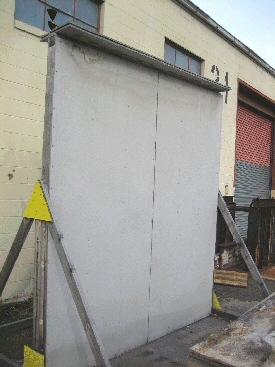 This unpainted 440 SoundBarrier® assembly now has spent an amazing 483 days outside the Homasote Company factory in West Trenton, New Jersey, weathering six Northeast seasons, including powerful hurricanes and a blizzard since being built on April 1, 2004. We wanted to demonstrate the weather resistance and strength of Homasote® as a premium exterior vertical sheathing by leaving it outside for a month or two. But we didn't take it down and after 483 days the board is still dry, still structural, and the seams are still properly spaced. Nearly 16 months (483 days) exposed to the elements, the assembly proves the weather resistance of Homasote®. A zoomed-in shot of the assembly after 483 days showing that the seam between the two panels of 440 SoundBarrier® remains straight and continues to conform to the 1/8" to 3/16" space specified in Homasote installation instructions. 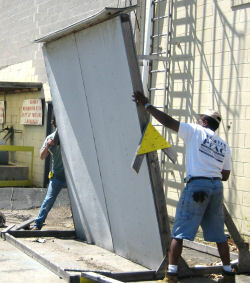 WEST TRENTON, NJ — (April 1, 2004) — The carpentry shop builds a test wall for evaluating 440 SoundBarrier® as exterior vertical sidewall sheathing in 4' x 9' panels. 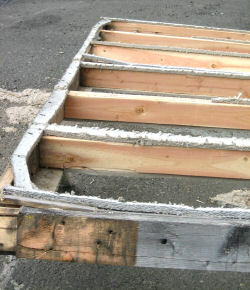 As you know, builders have used 4' x 8' panels for exterior vertical sheathing for decades. In assembling the outside wall (Photos #1 and #2) we followed 440 SoundBarrier installation instructions. The assembly was placed outside Door 32 of the Fabrication Department.